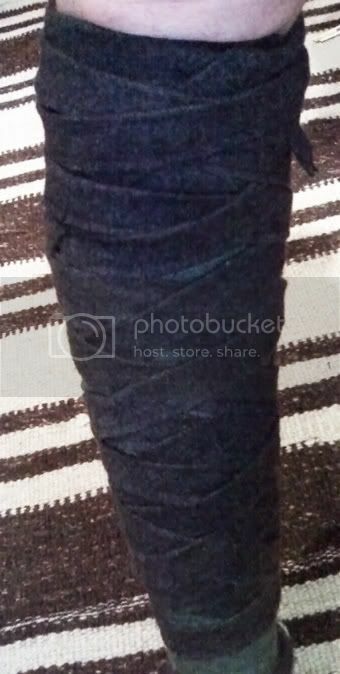 How do you get the criss-cross effect on leg wrappings as illustrated here in the Osprey picture? I think I'm going to try this....still think it's possible..... :? Paul, I recently got some Italian WW2 putees and thin Viking winingas, each strip must be nine feet long, and I can't get it either. I'm fairly convinced the artistic representations are stylised and depict a normal but tight criss-cross pattern using thin strips (like the Viking winingas) on top of leggings or conventional style putees. On some representations like the Piazza Armerina mosaics you can just make out possible end bits where the strips are tucked back through and stick out a bit. This is what my trials and tribulations have come up with as well. Your illustration above looks like it interprets the original representations. I used to start from the centre at the ankle and criss cross up, but it looked untidy and fell down all the time. I usually use large rectangular wraps now, based on that leg find, but if I need the padding for greaves, I currently start at one end, and wind up overlapping heavily & climbing at a shallow angle, which looks exactly like WWI era puttees. In fact, I just quickly tried again, and I had to use a pair of winingas for one leg :? That's 18 feet of thin straps on top of 8 feet of putee. I think it's about starting with one end at the top and spiralling it down the leg, then back up again. Then do the same with the second strap but feed it under the previous layers on the way back up.... I think. Hastily done, but I think the lower part was going somewhere interesting. That looks alot like an old style of bandaging i was taught on a 1st aid course a few years ago, if i remember right it gave a criss cross effect from one strip. If i can find a bandage i'll see if i can remember. 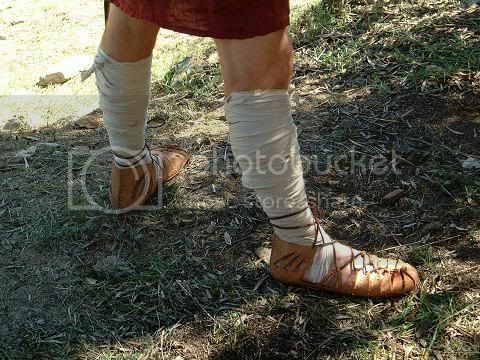 Quote: In fact, I just quickly tried again, and I had to use a pair of winingas for one leg :? That's 18 feet of thin straps on top of 8 feet of putee. I think it's about starting with one end at the top and spiralling it down the leg, then back up again. Then do the same with the second strap but feed it under the previous layers on the way back up.... I think. This book details the lives of Late Roman legionaries garrisoned in Britain in 400AD. It covers everything from battle to rations, camp duties to clothing. Does it need a cross at the front and the back? i can't tell from the picture. I just found a bandage and had a go and it's a kind of 'figure of eight' wrap that gives a cross at the front and parallel lines at the back. I think it just crosses like that at the front. I am going to have some long ones made and have a go. It isn't going to be overcomplicated, it's only a strip of cloth. Perhaps 2 inches wide? This is beginning to bug me. I just tried with a roll of paper, close but no cigars yet! You have to begin at the middle of the ribbon not at an end, and then wrapping alternatively both sides all around the leg, beginning at the toe tip up the knee. Ivan jumped in just before me. You have to roll up the puttees from either end until you have two rolls.Start in the middle and cross in front as you unroll each side equally. I'm not sure about this necessity of beginning at the middle anymore, and I reckon you can do either way. Has anyone else tried using two pairs of straps on one leg, or an 18 foot length? I'm fairly sure that's the key. Also, overlapping alternately with each spiral (left over right, then right over left). Another key factor might be not wrapping directly onto the leg, but onto a legging which helps keep them in place. He started in the middle, as Faventianus explained.